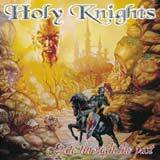 Holy Knights are a symphonic power metal band out of Italy. Italy has sure made a strong presence on the metal scene during the last few years. Well, I guess we are in the middle of the NWOIHM (New Wave of Italian Heavy Metal)?? I like a lot of bands coming out of Italy these days, but this means there is certainly a good bit of competition out there. With bands like Rhapsody and Domine, it will surely take A LOT for a new band to make some noise on the metal scene. Gate Through the Past is the band's debut album, and a fine one it is. While it is stronger than the recent debut albums of countrymen Dark Horizon and Fantasy (at least production wise), Holy Knights are still "second tier" symphonic metal when compared to the aforementioned leaders of the "NWOIHM." Aside from the cheesy cover, Holy Knights deliver a strong debut with well composed symphonic overtones and even some folk influences. The folk influences certainly separate the band from becoming just another Rhapsody clone. The song structures are nicely done with time changes, tempo changes, and interesting symphonic textures. You will also find some powerful and galloping riffs as well as several interesting guitar solos throughout. The drummer is also a fine asset to the band. He is able to provide a solid and very tight backbone to the fastest riffs. He is also able to mix things up beyond a simple double bass and a 2 - 4 beat snare hit to give the overall sound more depth. The vocalist holds his own very well and does not go out of tune, but I'm not sure that he has an extensive range as he appears to strain just a bit in the high registers. There are a few strong songs on this CD that standout, but there are a number of very average songs that are well done as far as musicianship goes yet fail to imprint themselves into your mind (mainly the second half of the disc). As the title and cover are indicate, the subject matter deals with the common theme of knights off to battle, demons, brave quests, and other fantasy themes. The fourth track, The Revival of the Demon is a brief spoken track which as the title indicates, is a bit corny. I could have done without it, but not a big complaint. They have certainly taken the safe path as far as the lyrical content which may hinder the band's ability to find their own identity and stand out in the ever growing symphonic metal scene. However, it is very obvious that these guys are very talented with their instruments. For a debut, this album is well produced but there is some room for improvement. Second tier production is the best way to describe it. They certainly do not match the level of Blind Guardian, Rhapsody, or Edguy. However, I have heard production much worse than this. The debut album of Fantasy would have been excellent had it not been for the shabby production for example. As for the music itself, I like the symphonic and folk arrangements, but I think the band needs to work on some bigger chorus lines to make the songs more memorable and majestic. After listening to this CD several times, I am quite satisfied with the musicianship and feel that the band have release a commendable debut, but there are too few standout moments to make this album special to me. If the band can explore a less familiar subject matter for their next album and create a few more songs that grab the listener and beg to be played again and again, Holy Knights should be able to make a splash in the metal scene. This is a very encouraging debut and worth checking out if you are a big fan of symphonic power metal. Good job guys!